Preheat oven to 375 F. Mix flour, oatmeal, vegetables, & sunflower kernels in a bowl. Whisk the water & oil together and then mix into the flour fixture. Fold with a rubber spatula until it starts to turn doughy. Knead dough for 2-3 minutes and roll out 1/4″ thick. Cut into shapes and place on ungreased cookie sheet. Bake for 30-45 minutes or until the bottoms of the biscuits become brown. If they don’t seem hard enough, leave them in the oven as it cools. ** (We got 42 bones when we made these!) Store in air-tight container and freeze extras, if desired. 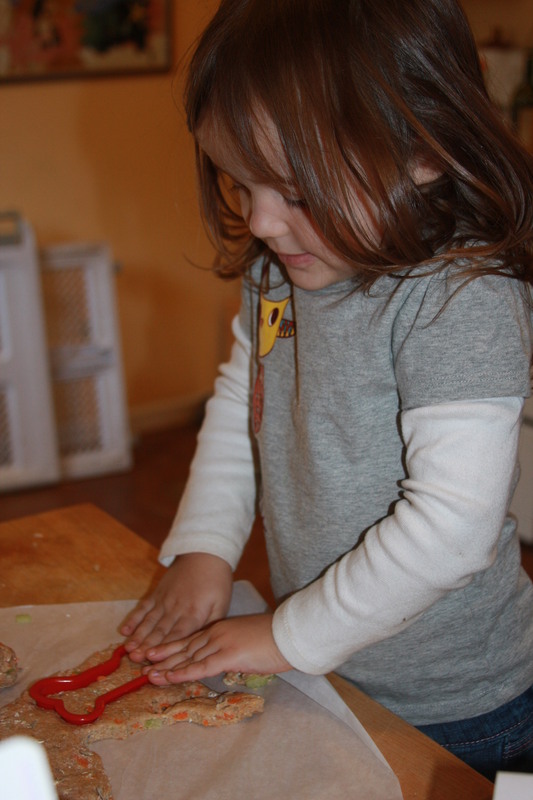 Sofia loved to help cut the "bones"
Whats this? A HOMEMADE bone?!! ** UPDATE: I would definetly recommend leaving them in the oven to cool or even flipping them halfway through the cooking time to make sure both sides are good and brown. If you don’t cook them until they are nice & crunchy, they will get almost rubbery after a few hours (which could lead to them getting moldy after several days). So… cook those bones until they are “bone-hard”! 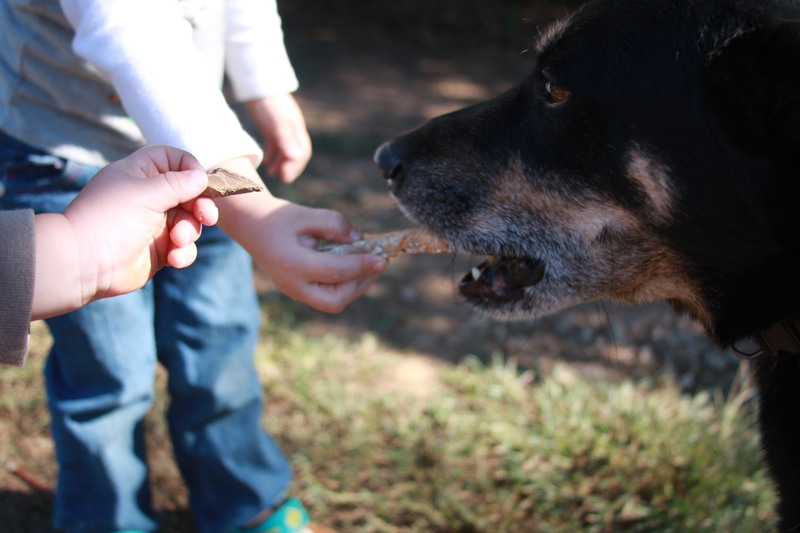 This entry was posted in baking, child's play, Pet Stuff, Uncategorized and tagged dog, dog bones, homemade treats, pet treats, Vegan, vegetarian. Bookmark the permalink. Cool, Ree. I’m wondering how these stack up, calorie-wise, to store-bought doggie treats. The obvious advantage is that they’re all healthy ingredients–but our guys are a tad overweight and I’m trying to get them slimmed down a tad! I would imagine most store bought bones contain lots of junk like preservatives, food coloring, etc. depending on what you buy them. Im sure you could add a meatier flavor if you added used oil (like the oil left over after cooking bacon or tempeh or something)… or maybe a dash of liquid smoke, tomato paste, peanut butter… there are lots of other veternarian approved options that Im gonna be testing out on my dogs! I will be putting up some more recipes after we run out of these and try making other kinds. Yeah, I know there’s JUNK in the store-bought ones, for sure. I’m just talking calories here. Luke is a little overweight, but Zeke is FAT! Can you work up a homemade diet cookie for them? I’d make them all the time if you did!! Yes I will try to make a good diet dog cookie! 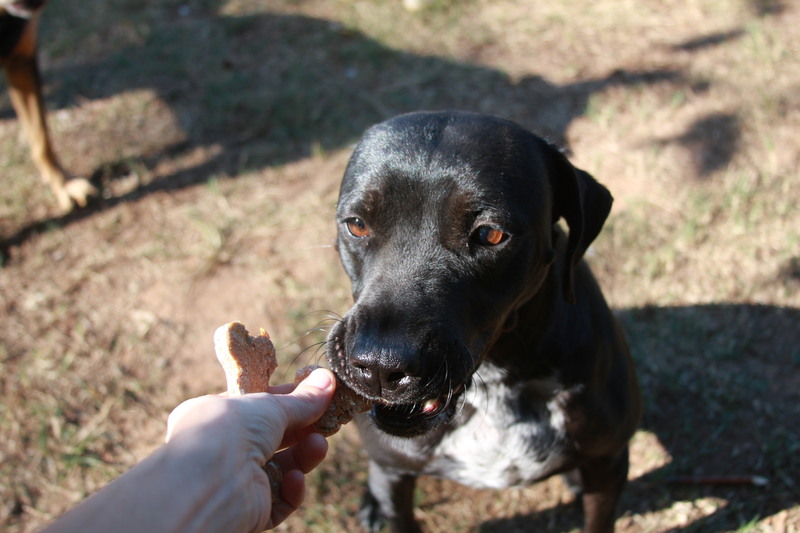 The ones here are pretty bland… my dogs like them okay, but I KNOW I can make a yummier one! Like, I totally should’ve used veggie broth instead of plain water. That makes a big difference in recipes I make for myself! 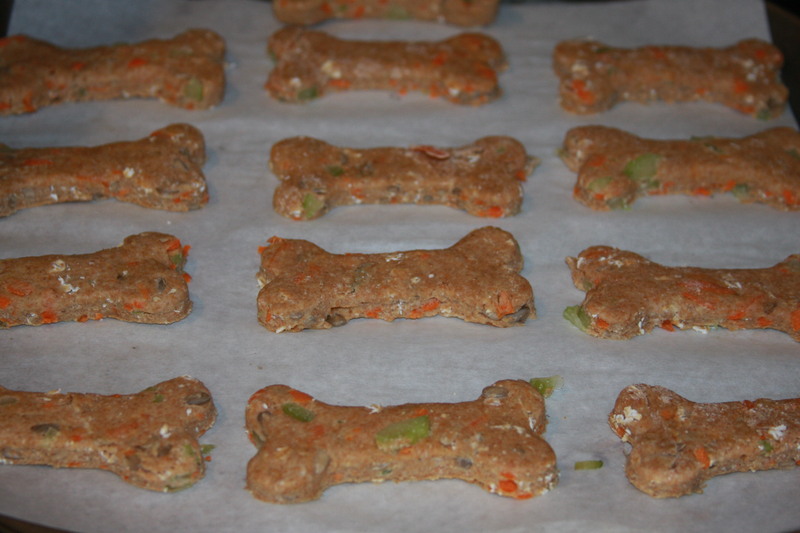 The kids had so much fun making these too, i foresee many more dog bone flavors in our future!